When you already have some experience with Python, building your own portfolio of data science projects is the best way to showcase your skills to potential employers. But where do you begin with developing your very first Python project? First, Why Develop a Data Science Project? Studying. The best way to learn is by doing. Of course, you may need to take some introductory courses first to understand the basics of Python if you’re a complete beginner. Afterwards, you can learn on your own by defining an interesting problem and working on a solution using online tutorials, documentation, and forums. Practicing. Projects are a great opportunity to practice the skills you’ve acquired. By developing your own projects, you can apply your newly acquired knowledge to some real-world tasks. It’s also a great opportunity to test yourself—are you ready to create your own project from scratch? Demonstrating your skills. Even for an entry-level position, data science companies often prefer candidates with at least some exposure to a language like Python. A project is the best way to showcase your data science skills. Showing your motivation and dedication. When you finish your own project without any external incentives, it shows your potential employers that you’re truly passionate about pursuing a career in data science. From an employer’s perspective, self-motivated employees are a great investment. And of course, if you pick a good project, you’ll also have fun. Anyone who loves to code will tell you there’s no feeling like solving real-life problems while getting your hands dirty. Every data science project begins with a well-defined goal: What do you want to achieve with this project? You can apply similar logic when developing your first Python project for your portfolio: What skills do you want to demonstrate with this project? For example, to demonstrate your data cleanings skills, you may take some real-world messy data and prepare it for analysis. If you want to practice exploratory data analysis and machine learning, it’s possible to find some online datasets that are already preprocessed and ready for analysis. We’ll take the second approach here, which allows us to demonstrate the principles of developing data science projects more efficiently. So, we’re going to use the famous Boston Housing dataset, which is available online but can be also loaded from the scikit-learn library. One bonus of using a popular dataset is that at the end of the project, you’ll be able to see how your model performs compared to those of others—just check Kaggle’s leaderboard. The objective of this exploratory project is to predict housing prices using the 13 features (e.g., crime rate, area population, number of rooms per dwelling) and 506 samples available in the dataset. If you’re unfamiliar with any of these, we cover most of them in our Intro to Python course. As you can see from the list of keys, the dataset contains data (values of 13 features), target (house prices), feature names, and DESCR (description). - ZN proportion of residential land zoned for lots over 25,000 sq.ft. In the first step, we created a DataFrame with features only, and then we added a target variable—housing prices (MEDV). One last thing: It’s always a good idea to check your new dataset with the info() and describe() functions. Great! You’ve demonstrated how to create a DataFrame and prepare raw data for analysis. Let’s now continue with some exploratory data analysis. 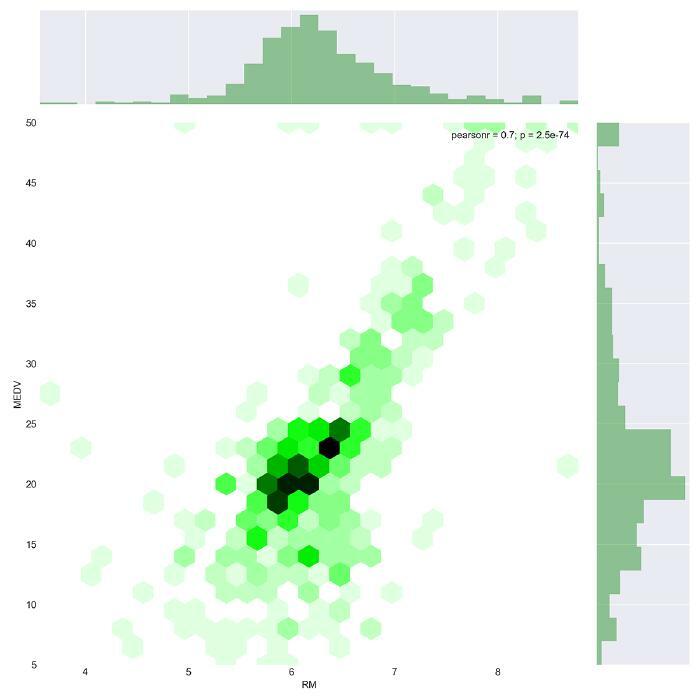 Since this is a data science project intended to showcase your skills to potential employers, you may want to draw multiple plots of different types to display your data in an intuitive and understandable format. 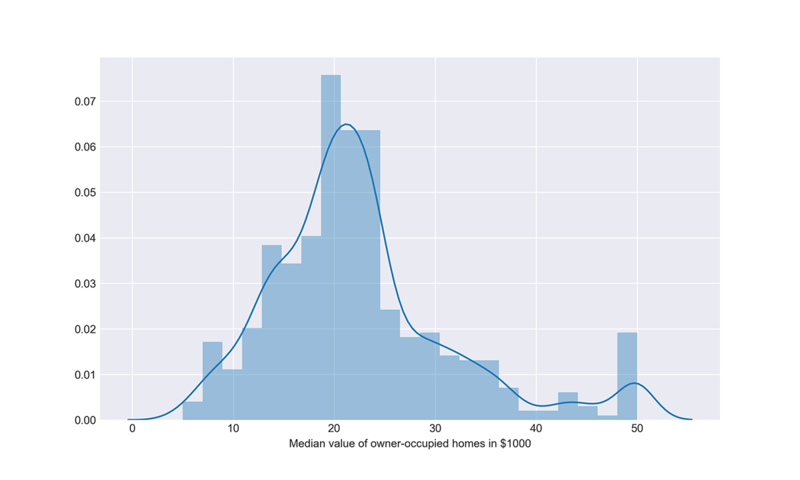 This plot shows that houses in the Boston area in the 1970s were valued at $20–25K on average, ranging from a minimum of $5K to a maximum of $50K. Strong negative correlation (-0.74) with the share of the lower status population (LSTAT). Strong positive correlation (0.7) with the average number of rooms per dwelling (RM). By using the optional reg parameter, we can see how well a linear regression model fits our data. In this case, our assumption about a linear relationship between the variables (LSTAT and MEDV) is quite plausible, as the data points appear to lie on a straight line. As you can see from the plot above, the sample cases include lots of houses with 6 rooms and a price around $20K. Furthermore, it’s clear from this visualization that a higher number of rooms is associated with a higher price. This relationship can be approximated with a linear regression model. You can think about other ways to explore this dataset further. But in the meantime, let’s move on to the machine learning part of our project. Specifically, let’s see how we can model the relationship between our features and target variable so that the model’s predictions about housing prices are as accurate as possible. First, we need to prepare our dataset for this part of the project. In particular, we need to separate our features from the target variable and then divide the dataset into a training set (75%) and a test set (25%). We’re going to train our models on the training set and then evaluate their performance on the unseen data—the test set. This model gives us an RMSE of about 5.2. Moreover, an R squared value of 0.72 means that this linear model explains 72% of the total response variable variation. This is not bad for the first try. Let’s see if we can achieve better performance with another model. 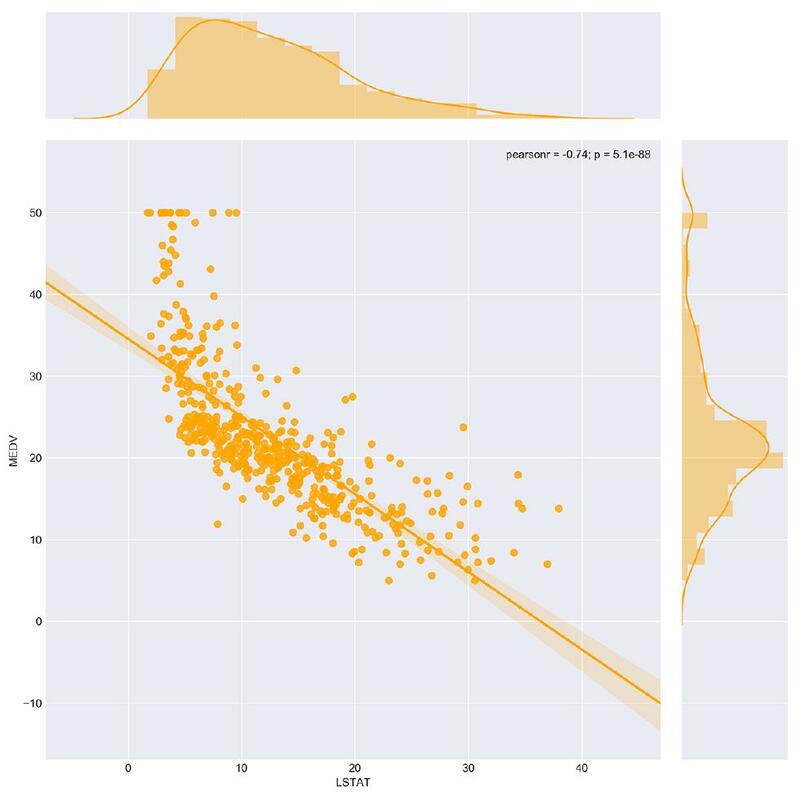 It seems a random forest is a much better model of our Boston Housing dataset: The error is lower (RMSE = 3.5), and the share of explained variation is significantly higher (R squared of 0.88). That’s it! Now it’s time to share your project with the world. If you were using Jupyter Notebook as your Python IDE, you can share the notebook directly, but preferably save it as a PDF file so it’s more accessible. Another option is to share your Python projects via GitHub. Don’t forget to include extensive comments on your findings. 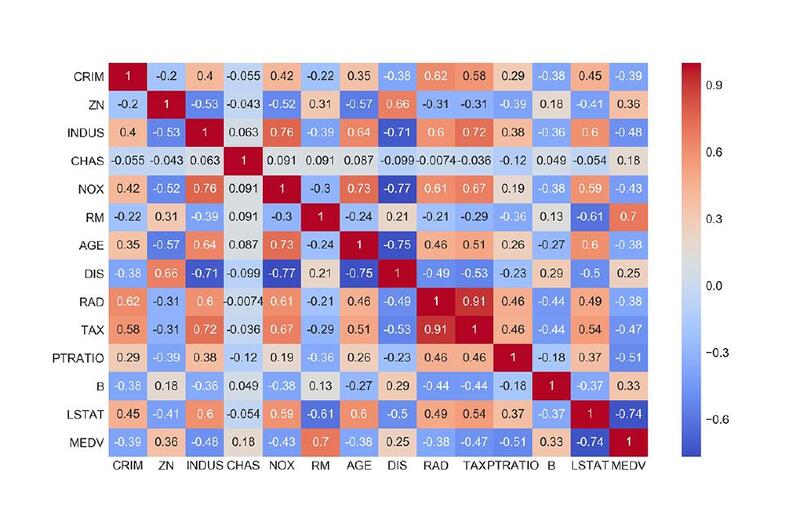 Drawing appealing and meaningful plots or building machine learning models are important skills, but a data scientist should be able to tell a story based on all the plots and models used. So, use each of your projects as an opportunity to demonstrate your skills of discovering patterns and drawing conclusions based on raw data. In case you feel like you need additional guidance before developing your first project with Python, check our Introduction to Python for Data Science course. It covers lots of concepts required for developing successful projects not only during your study process but also when solving some real-life problems at your workplace.